JustRite Stampers is the sponsor this week at 2Sketches4You, some of the JustRite Design Team is playing along with this weeks sketch. I often get questions on how I color my images. I love to color, and since I don't own any Copics, I'm a big fan of the Marker Watercoloring Technique - the technique was printed in an issue of TJNL last year. I love working with the different techniques in the newsletters. 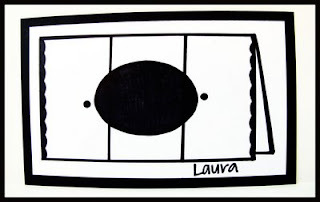 I emailed Pat and asked her if it was okay to share how I used the technique in my artwork. The image I've used for my post and Tutorial are from the Autumn Blessings Set from JustRite, shown here. These beautiful Fall Borders and Centers fit onto the 2-1/4" x 3-1/16" Wooden Stamper. I used the Apple Basket image. 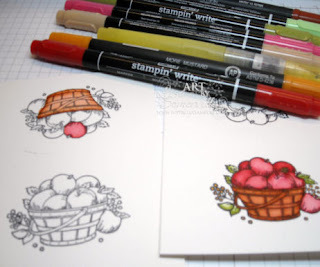 I've tried many different types of watercolor paper and have found I get best results using Stampin' Up! 's Watercolor paper. Stamp your image in Black on watercolor paper, let dry. 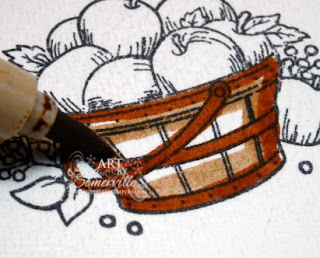 For the Basket I'm using Really Rust and Creamy Caramel Markers. Start by drawing an outline around your basket image using the Really Rust Marker. Next, draw an outline with your Creamy Caramel Marker right next to the Rust. 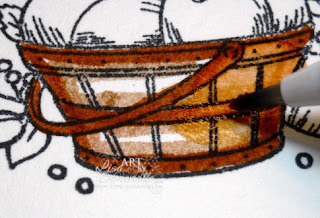 Using your wet tipped Waterbrush, move the inks in a circular motion, pulling the darker Rust ink into the Creamy Caramel ink, then into the center of your project. Repeat as desired using other markers on the remaining images. I used Real Red and Melon Mambo on the Apples, and Old Olive and Certainly Celery on the green leaves. Here's my finished card, I used Spellbinders Oval and Oval Scallop Dies to mat the image. The beautiful plaid DSP is Basic Grey June Bug. Be sure to grab your stamps and play along with this weeks JustRite Sponsored Sketch at 2Sketches4You for your chance to win $100 Gift Certificate from JustRite! Thank you so very much for showing how you use markers for watercoloring. I know it's a basic technique but there of are so many of us (including me) who are new to stamping and really need a few tips on how to do these simple techniques. After seeing how you do your images I can already see what I'm doing wrong. Thank you again! WOW beautiful card. Loved it. The watercoloring is stunning. I really liked your turtorial as well. I have some SU water color papers - so I am all inspired to give this a try. Wow nice job you did and thank's for your tutorial I like how you colored the image.Thank's for playiong at 2sketches4you. 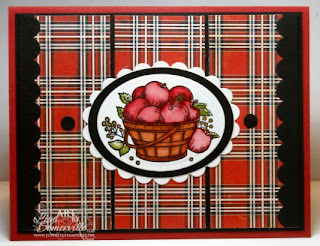 OMG, your card is gorgeous, I love, love the plaid, and your watercolouring is gorgeous!!!!!!!!! I like the tutorial on the markers! Thanks for sharing this! A beautiful card! WOW this card is so professional! I love it :) Thanks for playing at 2S4Y!